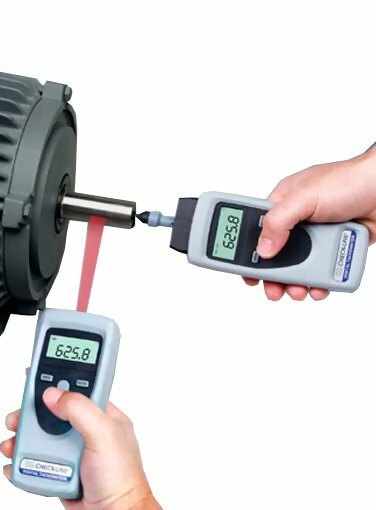 The Checkline CDT-2000HD Combination Hand-Held Digital Tachometer combines the best features of both contact and non-contact models to accurately measure RPM, surface speed and length. When using the non-contact mode, rotational speed (RPM) is measured using a visible beam of light. The CDT-2000HD can be up to 24 inches away from the small piece of reflective tape that is affixed to the rotating element. In the contact operating mode, the speed is sensed by directly contacting rotating device using one of the contact adapters supplied with the instrument. The CDT-2000HD's rugged construction, portability and outstanding features make It an ideal choice for maintenance personnel, machine operators or others in a wide variety of machinery and material handling applications. 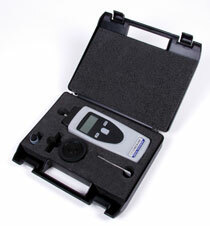 The CDT-2000HD includes the Tachometer, Slide-In Contact Adapter, 6" Universal Surface Speed Wheel, Cone Tip Adapter, Reflective Tape, Two (2) AA Batteries (1.5 V) and Operating Instruction Manual -- all supplied in a foam-fitted, hard-plastic Carrying Case.